Here's where you can find some frequently asked questions about general billing information for SetHero. How is my team size calculated? 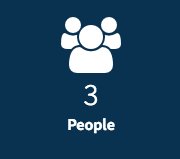 Your cast/crew count comes from the total number of individuals on the people tab of a given project. You can find this number on the "Dashboard" page.